Given a specific allocation scenario, what are the protection levels and fill rates at each depot? Given a specific number of serviceable parts, how must they be allocated throughout the operation network? Given required fill rates, how many parts must be stocked at each depot? How many spare parts must be stocked at various depots in order to minimize the total inventory cost? We have successfully applied the multi-echelon inventory modeling for repairable/rotable parts to develop and implement Spare Engine Planning System (SEPS), a module of our Advanced Engine Maintenance Planning Systems. 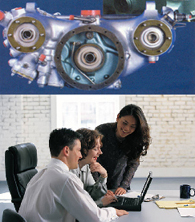 Engines are the most expensive aircraft rotable items, and SEPS uses the state-of-the-art analytical technique for managing the inventory of repairable parts, leading to reduced costs and increased performance.